Stencil on a striking new look with one of our creative pastry decorating stencils. Whether you're catering a big event or simply spicing up your usual inventory, these designer stencils will transform your baked goods into a work of art. We stock a number of stencil types, including 3D mats for vertical placement, stencil grills, mats, decorating combs, and tuile templates. There's something for every dessert in this category, whether you're designing a custom wedding cake or adding a little sweetness to your favorite cookie recipe. We have something for every dessert type and decorative style, so be sure to look around and find an exciting addition to your cake decorating toolkit. You can do a lot with a good decorating stencil set, so unlock your design potential with your very own decorating stencils in a number of shapes and styles. 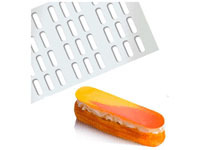 Take a look at our most popular pastry decorating tools, including stencil grills, tuile templates, decorating combs, and other essentials. These bakery tools can be used with your most memorable recipes, whether that's crisp tuile cookies to go with your warm desserts or delicately decorative wedding cakes for customers and friends. These stencil sets range from easy to moderately difficult, so grab something that meets your experience level or take a crack at a new skill with 3D decorating mats, SugarVeil kits, or petite conefctioner's spreaders for a variety of recipes. These sets make great gifts for students and those just learning the ins and outs of professional cake decorating, so be sure to pick up one for yourself and some for your friends.